Day by Day with God is published by BRF (the Bible Reading Fellowship), written by women for women. Each day a Bible passage is selected, a key verse focused upon, and then an explanation or application is suggested, along with further suggestions to help move women forward in their spiritual journey. 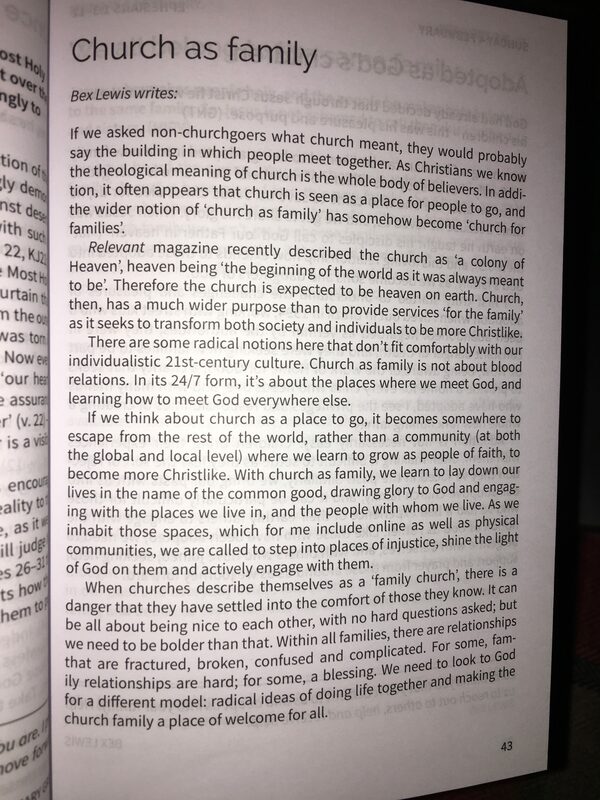 This is the second time that I’ve been asked to write for these Bible notes, and was given the theme of ‘Church as Family’, which as a single woman I was particularly happy to be asked. On #WorldCancerDay, I have been very grateful for the wider church family for their prayers and practical support, and also those outside the church, especially #YBCN (for under 45s), and UK BC Support Group, and #WIASN and @beyondchoc, throughout my own cancer treatment. Always great to receive the finished item. #daybyday with God. #biblenotes. My topic ‘Church as family’ for February 2018.